Red Wines and Seafood? Yes! Merlot is our first fishy friend and works incredibly well with tuna and marlin. Whether it is steaks on the barbecue after a deep sea fishing expedition, or working with Mediterranean style vegetables and salads alongside marlin or tuna based dishes, a bottle of red wine such as merlot is just the ticket. I like that pairing and have actually used it. 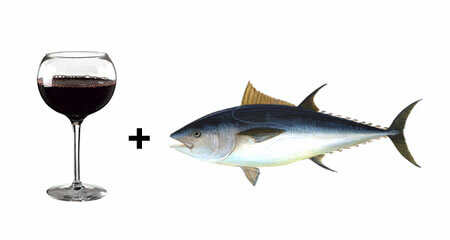 Merlots tend to be on the lighter side, and tuna is hardly a delicate fish. Pinot Noir is another tuna lover who extends its range to lobster and salmon of all kinds, especially natural, baked or grilled. Beyond the standard pinot noir and salmon nibbles, the lovely light nature of Tasmanian Devil’s Corner Pinot Noir coupled with its unique smooth cherry tang makes for an awesome combination for several different varieties of salmon or if tuna steak is your treat, you cannot go past the Yarra Valley favourite of Blue Diamond Label Pinot Noir. The author goes on to suggest matching Shiraz to smoked salmon, and Rosé for just about any kind of seafood. These suggestions are a bit more tenuous, in my opinion. Shiraz wines can be quite bold, but so, I suppose, can smoked salmon. And I’m not a big Rosé fan, though I can see why the author would suggest it goes well with many kinds of seafood. And for the most delicate seafood, I’d still recommend the traditional white wine pairings. A fine filet of sole, for example, would get blown out by just about any red; stick with a Sauvingon Blanc or perhaps a Pinot Grigio. This entry was posted in Merlot, Pinot Noir, Red Wines, White Wines and tagged fish, food, seafood, wine pairings on January 14, 2011 by Roger.